On March 25, Baby Bu entered the world! He had 6 littermates. And now, I'm counting the days until he's mine! 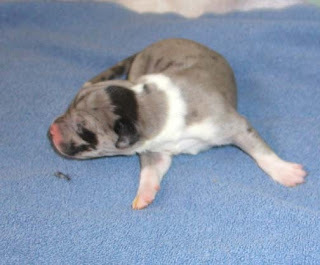 Here he is at 3 days old. I can't wait till I can see a better picture of that cute little face. But, aren't you just in love with his pink nose and cute little toes? They won't be that small for very long!